Avery Peak, Bigelow Mountain Range. 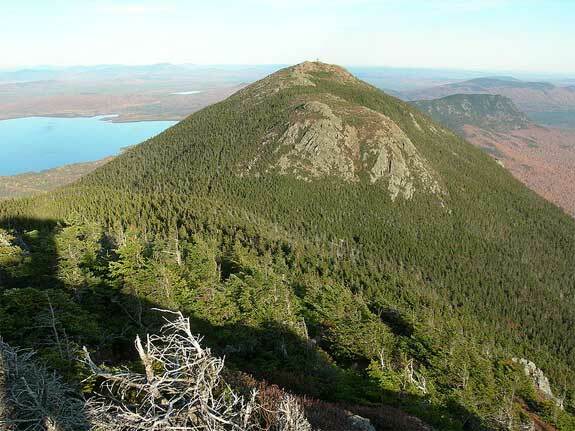 Bald Mountain Public Reserved Land, located near the New Hampshire border and the town of Oquossoc, is an outdoor adventureland for hikers, snowmobilers, bird-watchers, snowshoers, and hunters. The highlight of this area is a one-mile trail to the summit of Bald Mountain, which offers panoramic views of surrounding mountains. The area is open year-round and displays spectacular fall color during the autumn months. There is no entrance fee; call 207-778-8231 for more information. The Bigelow Preserve is located just east of Stratton in western Maine. Accessed by gravel roads off of Route 27 in Carrabassett or the Long Falls Dam Road in North New Portland, this 36,000-acre preserve includes seven summits of the Bigelow Range. The northern boundary of the preserve is the 20,000-acre Flagstaff Lake, which has excellent canoeing and fishing opportunities. The mountains and lakes appeal to hikers, anglers, cross country skiers, snowmobilers, snowshoers, mountain bikers, and campers. Although the preserve is open year-round, it is least busy in the springtime. There is no entrance fee; call the Western Region Public Lands Office at 207-778-8231 for more information. The Chain of Ponds Public Reserved Lands unit consists of four connected ponds — Natanis, Long Pond, Bag Pond, and Lower Ponds. Small thoroughfares connect each pond to form the chain for which this land unit is named. A nearby commercial campground offers sites with toilets, showers, and other amenities. For those seeking a backcountry experience, there are remote primitive sites near the lakeshore. Chain of Ponds is an excellent location for campers, canoeists, and those interested in seeing wildlife. There is a hand-carry boat launch as well as a trailered boat launch for fishing and boating enthusiasts. Access to Chain of Ponds is north of Stratton off of Route 27. No entrance fee is charged; call 207-778-8231 for more information. The Dead River is 42.6 miles long, stretching from Flagstaff Lake to the Kennebec River at The Forks. The Dead River Public Reserved Land consists of several miles of shoreline where the river originates at Flagstaff Lake. To access the land, take Long Falls Dam Road from North New Portland. The area is popular with ATV riders, canoeists, cross-country skiers, anglers, horseback riders, hunters, mountain bikers, snowmobilers, snowshoers, swimmers, and wildlife enthusiasts. Several campsites dot the lake shore and river banks, providing a backcountry camping experience. There is no entrance fee to use the land. Call 207-778-8231 for more information. Four Ponds Public Reserved Land is located just east of Mooselookmeguntic Lake in Frankline County. The best way to access the land is via the Appalachian Trail off of Route 17 in Township D or from Route 4 in Sandy River. The Appalachian Trail passes directly through this reserved land area, making it popular with hikers and backpackers. The 6,000-acre unit features ponds and forests, providing opportunities for campers, swimmers, canoeists, cross-country skiers, hunters, hikers, anglers, snowmobilers, snowshoers, and wildlife watchers. There is an Appalachian Trail lean-to at Sabbath Day Pond as well as a designated campsite at Little Swift River Pond. Access is free year-round; call 207-778-8231 for more information. Mahoosuc Public Reserved Land is a popular backcountry area in Oxford County in western Maine. The unit borders Grafton Notch State Park. The Appalachian Trail passes through this land area, which includes 12 of the most challenging peaks along the trail’s entire length. The Mahoosuc Public Lands also include a 9,993-acre Ecological Reserve that preserves rare plant and animal species. The unit is popular with hikers, backpackers, campers, snowmobilers, cross-country skiers, snowshoers, and wildlife enthusiasts. Vehicles can access the area from the north by East B Hill Road between Andover and Upton. Those coming from the south should take Sunday River Road from Bethel. The land unit is open year-round and does not charge a fee; call 207-778-8231 for more information. Richardson Public Reserved Land is located in the Rangeley Lakes Region and comprises over 22,000 acres. This unit includes 21 miles of shoreline on Mooselookmeguntic and Richardson Lakes. These lakes are part of the Northern Forest Canoe Trail, making the area popular among canoeists, campers, and anglers. The area is accessible by watercraft; launch sites are located at Oquossoc in Rangeley and South Arm in Township C. A fee is charged upon entry; call 207-778-8231 for more information.